This spring, we were very busy visiting our Daffan Cooling & Heating customers, checking and providing maintenance to their air conditioning systems. For customers with HVAC systems that were reaching the end of their lifespan, we advised them of their repair-or-replace options, or made arrangements to install new systems. We’re glad we took care of business early in the season, because we were anticipating a hot summer. 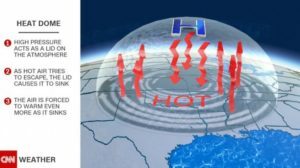 Sure enough, by mid to late July, a phenomenon known as a “heat dome” settled across much of the continental U.S., including the Granbury-and Weatherford area communities that we serve. A heat dome has a high pressure ridge that keeps hot air trapped for an extended time, and when you add muggy weather, heat indexes rise to triple digits. Not only is it uncomfortable spending any time outside, but there are health dangers, such as heat exhaustion or heat stroke. Another miserable effect of this weather phenomenon is the continuation of high temps even after the sun goes down. I think we’ve all looked at our outdoor thermometers at 10 p.m. and were shocked to see it still reading 90 degrees or more. “The challenge with heat domes, and the dangerous part, is the prolonged nature of the heat event. It’s days of heat, and even your nighttime lows don’t get very cool, so you don’t get a chance to cool off,” said NBC News meteorologist Sherri Pugh in an interview with nbcnews.com. During this blazing-hot time of year, another thing we keep an eye on is the region’s electrical grid reliability. Fortunately, area utility companies have been able to keep up with the demand so far, and we haven’t seen anything unusual coming from the ERCOT (Electric Reliability Council of Texas) news feeds. In May ERCOT said they expected to have sufficient generation capacity to meet the needs of our region this summer. Out west, it’s a different story: El Paso Electric Company in West Texas/New Mexico and some California utilities have warned customers of possible rolling blackouts if the grid reaches capacity during the heat wave.